June 20, Victoria, B.C: Co-operatives and Mutuals Canada (CMC) held their annual awards ceremony on June 20 in Victoria, British Columbia. Each year, CMC honours co-operators and mutualists who have made a valuable contribution to the development of the Canadian co-operative sector. The CMC Awards Committee selects award recipients based on nominations by member co-operatives. 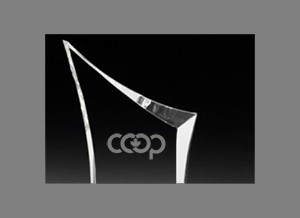 The Award for Co-operative Excellence honours individuals who have contributed significantly to the development of co-operatives in Canada and internationally. Kathy Bardswick, who retired as CEO of The Co-operators in 2017 after 39 years of dedicated service, received the award for 2018. An outstanding co-operator and leader, Ms. Bardswick has worked hard to promote co‑operative values regionally, nationally, and internationally. In addition to the lasting contributions made by her participation with International Co-operative Alliance, Ms. Bardswick is also being acknowledged as a driving force behind the establishment of the recently launched Canadian Co‑operative Investment Fund; she was a passionate advocate of the co-operative sector’s need to come together to support its own growth. The Award for Canada's Emerging Co-operator was presented to Julien Geremie, Deputy Executive Director of the Conseil de la coopération de l’Ontario (CCO). The award recognizes Canada’s outstanding young co-operators under 35. Mr. Geremie has excelled in the Ontario co‑operative movement since 2010, when he joined CCO. He has been Vice-President of Coopérative funéraire d’Ottawa, was the organizer of the International Year of Co-operatives in Ontario in 2012 and is a board member of the Coopérative radiophonique de Toronto. He was also a member of CMC’s Emerging Co-operators committee in 2014. He remains involved in many projects and is committed to exploring new ways of thinking about co‑operative education. Mr. Geremie is being recognized for his significant contribution to social and co‑operative economic development. The Small Co-operative of the Year Award was presented to the Co-operative Housing Federation of British Columbia (CHFBC). The award recognizes outstanding community impact by a co-operative. CHFBC is being recognized in 2018 as a co-operative innovator for its successful initiatives to address the affordable housing crisis in British Columbia. Its Community Land Trust model is creating, as well as preserving, a permanent stock of affordable housing. CHFBC has built a powerful engine for growth in the co-op housing movement by fostering partnerships with co-op and not-for-profit housing providers, and social impact lenders and investors, across three levels of government. CMC President Doug Potentier was pleased to welcome all of 2018’s winners to his hometown in Victoria, BC to receive their awards at a special ceremony, where he remarked, “It is my honour to recognize the incredible work done by these individuals and co-operatives to advance the co-op movement. The contributions we celebrate today, both individual and collective, are the substance and power of the change this movement brings to our communities, to Canada, and the world. Bravo to all. co-operatives and mutuals in Canada. Through advocacy with the federal government, CMC provides a knowledgeable voice committed to improving the economic and regulatory environment for co‑operatives and mutuals on behalf of our members. CMC's members come from many sectors of the economy, including finance, insurance, agri-food and supply, wholesale and retail, housing, health, forestry, education, funeral services, public utilities and community development. CMC provides leadership to support, promote, and develop the co-operative economy in Canada. The co-operative and mutual movement in Canada counts more than 18 million memberships from approximately 8,000 co-operative and mutual enterprises.